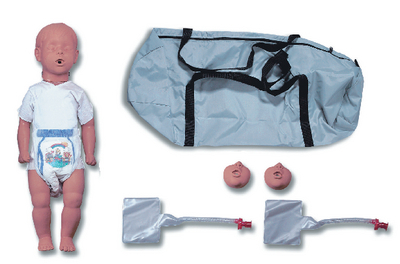 These rugged, full-body pediatric manikins last for years and offer economical operating costs to save you money during your career. Foam-filled, latex free, one-piece bodies offer uni-body construction for virtually indestructible handling. Cross-contamination is controlled with removable face pieces that clean easily and simple lung systems changed only once a day. Each unit comes with carry bag, three face pieces, three airways, and instructions for use. Replacement face pieces come 10 to a pack and airways come 24 to a pack.